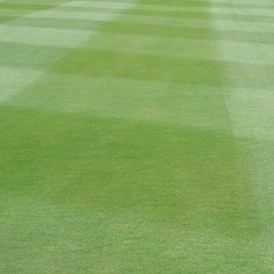 Ever wanted stripes in the fairways as straight as they are on the greens? 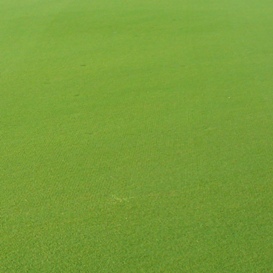 The A-Model PrecisionCut™ and E-Cut™ Hybrid Fairway Mowers do exactly that. Utilizing the same style steering cylinder as on the 2500B PrecisionCut and 2500E E-Cut Hybrid Riding Greens Mowers, the PrecisionCut and E-Cut Hybrid Fairway Mowers can mow the straightest lines of any mower in the industry today. 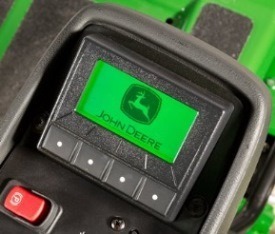 This reduced throttle setting is set quickly and easily using the TechControl display. 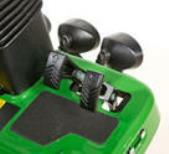 Simply use the password-protected mower set-up screen Engine Mow Speed to set maximum engine speed while in mow. 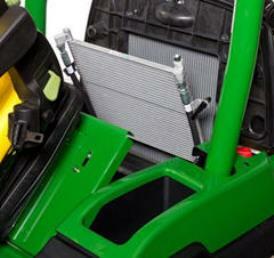 Once set, the engine speed automatically uses this rpm when the machine is mowing. 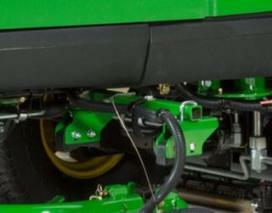 This allows complete control of sound levels and fuel savings. 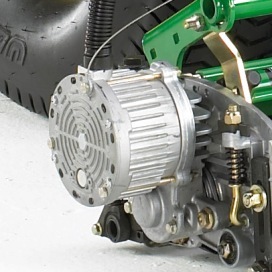 The 7500A and 8000A E-Cut™ Hybrid Fairway Mowers can be effectively run in mow at an engine rpm reduced to 2300 rpm. At this operating rpm, operators will experience noise reductions when compared to running the machines at full throttle. The MTSpiral roller and the MTGrooved roller (not shown) options are available for QA5 cutting units to minimize roller overlap marks. 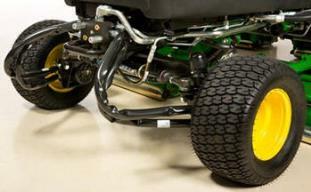 The MTSpiral roller and the MTGrooved roller options take the patented 2-in. 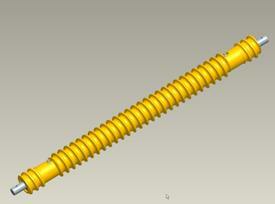 (50.8-mm) machine spiral roller to a whole new level. 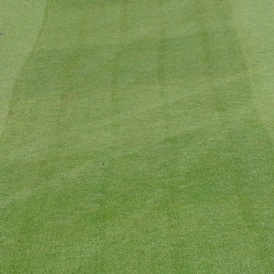 These designs reduce the number of times the grass is rolled in the overlap area of the cutting units. 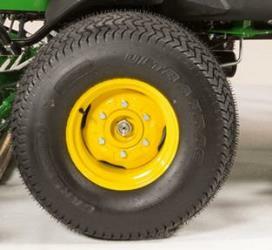 With these unique designs, the material in the overlap of the roller is machined down to a smaller diameter, allowing the ends of the rear cutting unit rollers to roll through the open space of the front cutting unit rollers. There are two types of overlap marks - reel overlap marks and roller overlap marks. It can often be difficult to determine what type of overlap marks a customer may be experiencing. In general, a roller overlap mark is roughly 3.5-in. (88.9-mm) to 4-in. (101.6-mm) wide, while a reel overlap tends to be 2.5-in. (63.5-mm) to 3-in. (76.2-mm) wide. Available for both the 18-in. (45.7-cm) and 22-in. (55.9-cm) cutting units, the MTSpiral roller and MTGrooved roller feature a true 18-in. (45.7-cm) and 22-in. (55.9-cm) length with tapered ends. This full-length roller, as compared to other shorter rollers in the marketplace, supports the cutting unit in turns and on sidehills without the gouging or marking. Since these are spiral and grooved rollers, they will tend to engage the turf more than a cutting unit setup with a smooth rear roller. A starting guideline is that all cutting units equipped with front and rear MTSpiral rollers, or MTGrooved rollers, be set up with a benchsetting of at least 0.050 in. (1.1 mm) higher to achieve a similar effective height of cut. Proper height-of-cut setting is critical for this setup. 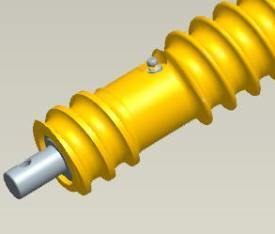 The optional MTSpiral roller or MTGrooved roller setup does not solve issues due to reel overlap marks. Height-of-cut when the MTSpiral roller or MTGrooved roller is used should be measured by placing the gauge bar approximately 4 in. (101 mm) from the end of the roller to stay away from the tapered ends. On conventional machines, the engine rpm is controlled by the operator by means of a manual or electric/manual throttle. Operators are trained to always operate the engine at wide open throttle. Running at wide open throttle means running the engine at its fastest speed, which increases the sound levels and fuel usage. 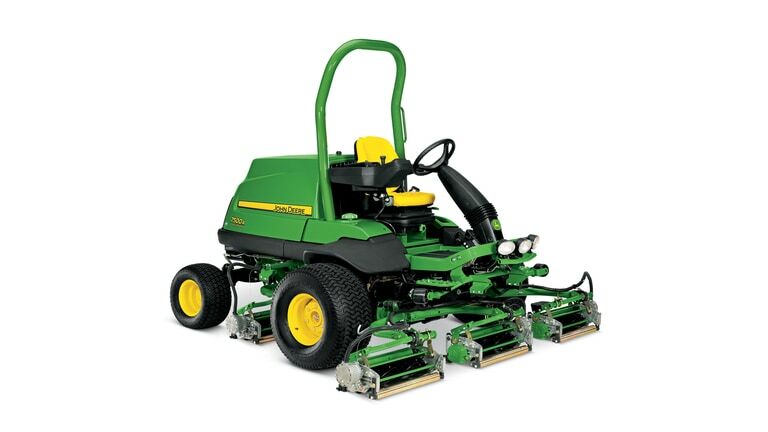 The A-model PrecisionCut™, E-Cut™ Hybrid, and TerrainCut™ mowers feature a radiator screen easily removed without tools and tilt-out oil cooler for easy cleaning. The A-model PrecisionCut™, E-Cut™ Hybrid, and TerrainCut™ mowers have the latest in advanced diagnostics through the TechControl display. 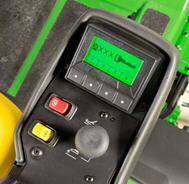 Most all diagnostics are performed while sitting in the operator’s seat.